Timed with the World of Concrete opening, the Concrete Joint Sustainability Initiative unveiled its 2010 goals and initiatives to align sustainable development activities within the industry. American Concrete Institute, Portland Cement Association and the National Ready Mixed Concrete Association chartered JSI in 2009 to align advocacy, technology and educational resources related to concrete sustainability, quickly enlisting a broad coalition of 23 other groups representing producers, practitioners and allied professionals from across the industry. This never-before-seen collaboration of the many market segments of the concrete industry will bring together its diverse resources to convey the social value of building sustainable homes, roads, schools and other structures, said Aris Papadopoulos (Titan America), vice chairman of the PCA Board of Directors and chair of the Concrete JSI. Concrete JSI's 2010 activities include the distribution of a series of nine PowerPoint presentations that communicate the purpose of the partnership and discuss each of the eight social values of concrete, as defined by the group. Member organizations will use these presentations to introduce both internal and external audiences to the shared message of concrete sustainability. 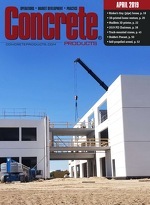 A new site, www.SustainableConcrete.org, serves as a member resource and the industry's primary portal for educational and outreach efforts related to the sustainability of concrete structures. Concrete JSI is also mapping out the research and development programs of each of its member organizations to identify synergies, overlaps and gaps to further develop and refine the research base related to concrete sustainability. That will minimize duplication of activities and greater cooperation in areas of technical committees, educational seminars, publications, certification, marketing and other related activities pertaining to sustainable development. The group also plans to maintain a presence at major sustainable building events and to magnify the industry's visibility and impact on green building practices.